Spray 9-inch square pan with cooking spray. 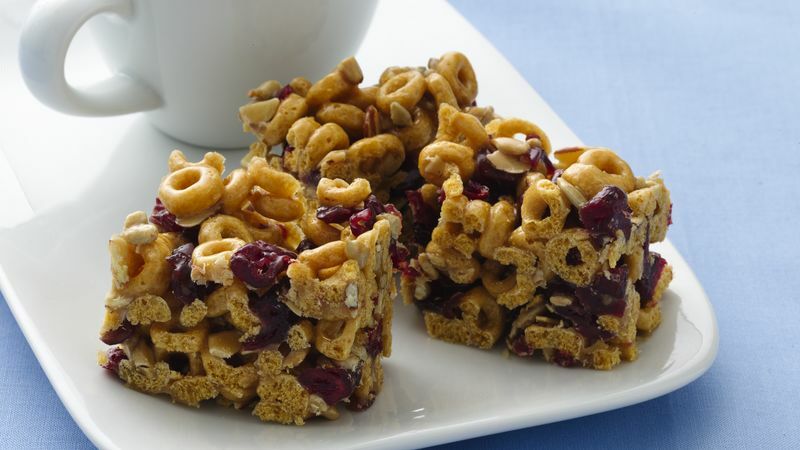 In large bowl, mix cereal, cranberries, almonds and sunflower nuts. In 2-quart saucepan, heat corn syrup, brown sugar and peanut butter to boiling over medium-high heat, stirring constantly. Boil and stir 1 minute. Remove from heat; stir in vanilla. Pour syrup mixture over cereal mixture; toss to coat. Press firmly in pan. Cool completely, about 30 minutes. For bars, cut into 6 rows by 4 rows. To toast almonds, sprinkle in ungreased heavy skillet. Cook over medium heat 5 to 7 minutes, stirring frequently until almonds begin to brown, then stirring constantly until almonds are light brown.